MOLY-LUB BULK | Pro Chem, Inc.
MOLY-LUB BULK is packaged as an alternative to our convenient aerosol in a 40-pound pail. 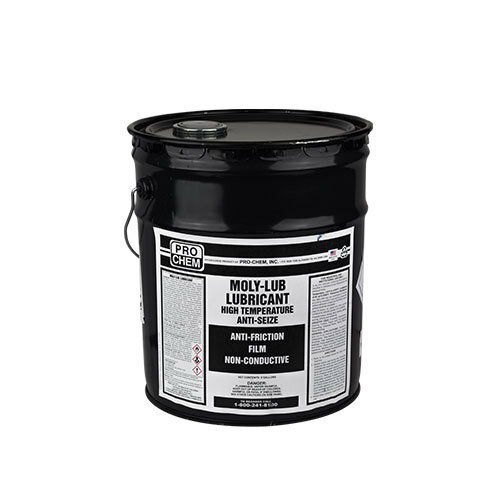 It does not contain any graphite, silicone, oil or grease and leaves a long lasting, dry film lubricant that will not attract dust and provides a tenaciously adherent coating. It is resistant to water, oil, alkalis and most acids and protects against moisture, rust, corrosion and galling of metal parts. It resists salt water penetration and helps machinery run smoother and longer. Prevents friction, fretting, wear, sticking, galling, seizing, binding, and chattering. Parts to be coated should be clean and dust free. Agitate before and during use. Spraying produces the most uniform and precisely controlled film thickness. Use a commercial spray gun of one quart capacity or less, or an air pressure sprayer with 40-50 lbs. pressure. Make sure working area is adequately ventilated. A single wet pass of spray usually deposits a film of about 0.0002 to 0.0003 inches thick; this thickness gives best adhesion and wear life. Dipping is an excellent application method if a high degree of film uniformity is not essential. Always keep container closed when not in use.